Choosing the right style of lighting for your home can transform your living space. Lights help to warm up a room, making it a bright and welcoming place to spend time and well thought out lighting will create a versatile room that can be used for a wide range of purposes. Whether you choose contemporary lighting or traditional lighting styles is down to a matter of personal taste. Contemporary lighting refers to modern lights and fittings that are designed with clean lines. Often made from metal, glass or crystal, the designs have a simple elegance that works well in minimalist homes. Contemporary light fittings can be striking in design and will create a strong focal point in the room. 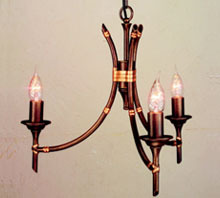 Traditional style lighting is more ornate in appearance and these lights mimic the style of previous decades. 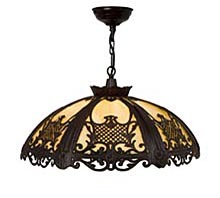 Styles vary from different countries and eras so this type of lighting can work well in a wide range of homes. Typical examples of traditional style lighting include brass lamps, colonial style light fittings, brass, nickel and gold pendant lights and decorative chandeliers. When choosing lighting for your home, it is always important to think about the practical needs of a room. A good source of overhead lighting is important for general purposes and an attractive pendant, chandelier, up lighter or semi-flush fitting can be chosen for the central ceiling light. In large rooms it is important to select a grand, impressive central light fitting so that it doesn’t get lost in the space. 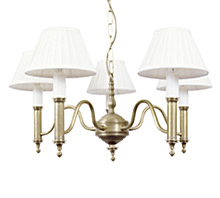 Here a traditional or contemporary style chandelier would work well, or a decorative pendant fitting. In smaller rooms a flush or semi flush light fitting will lay close to the ceiling, taking up minimal space. This can then be added to with table lamps for softer, more intimate lighting and wall lights, floor lamps or spots to provide a range of ambient options to appeal to different moods. Rochamp Lighting - Rochamp is a high quality specialist lighting manufacturer, who sells a range of decorative table lamps, standard lamps and lampshades. They stock both traditional and contemporary designs, and these colourful ornate lights and shades will complement many types of home. Newtra Lighting - Newtra is a Spanish contemporary lighting company, who design lights for the modern home. The Lumen range is made with clear or coloured glass in a choice of colours and these stunning lights will look beautiful in your kitchen, dining room or hall. Ryckaert - Ryckaert is a French lighting company who sell a range of classical, simple and elegant lights in a more traditional style. Their collection includes pendants, lamps and spotlights for the kitchen, living room, dining room and study with many items made from brass, nickel or gold. Impex – Impex lights are luxurious, contemporary, decorative light fittings that will add elegance and style to your home. You will find in their collection crystal chandeliers, beaded crystal pendants, cast brass pendant lights, traditional style desk lamps, Flemish wall lights, Halogen crystal Strass lights and shaded pendant lights. 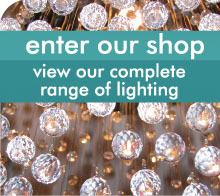 Elstead - Elstead lighting is a quality make of handmade light fittings for the home and garden. The range includes traditional and contemporary designs of chandeliers, wall lights, up lighters, garden and patio lights, table lamps and picture lights.